Welcome to the first tutorial covering sketching and vector drawing featuring bat drawings! 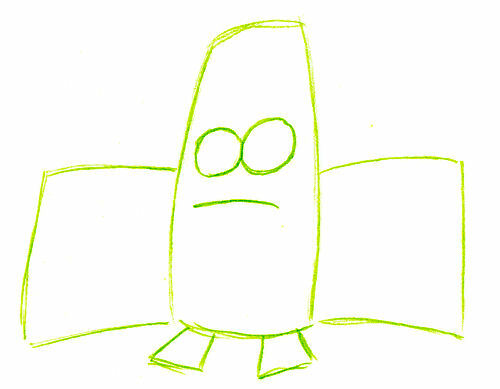 In this drawing lesson, you will learn how to draw a cute character from scratch. 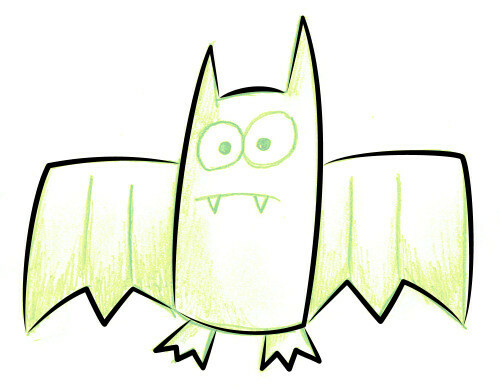 I will show you how to use simple basic shapes to create the sketches that will be used to create the vector version. Then, I will show you how to apply simple effects to create a great cartoon illustration that looks clean and professional. My goal was to use a template that is easy to reproduce and fun to work with! Start working on the most visible and obvious parts of the bat: the body and the wings. Draw a large rectangle in the middle to represent the body and add to square on each side to form the wings. Notice how the bottom of all three shapes are aligned together. When you are finished, draw two circles to illustrate the eyes and a simple line that will be used to create the mouth. Finally, sketch two small rectangles on the bottom of the body to represent the feet. Notice that the eyes are almost in the middle of the body. It's now time to work inside the shapes that were created previously. In the top area of the body, add a few lines to form the eyes and the top of the head. You can also add a few rectangles on each wing and on the feet. Remember that all the lines that were added in this step are inside the cartoon character, not outside. 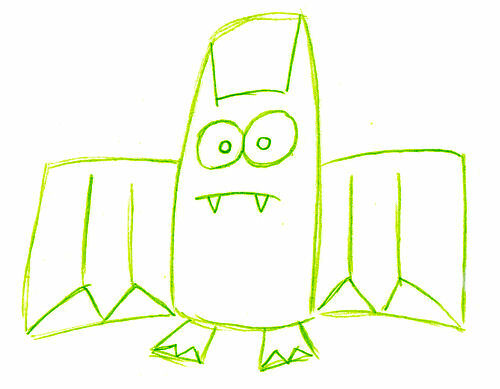 For this step, you can draw more details like the pupils, the teeth and a few lines inside the wings. Since my goal is to work with simple character, the character is now done! 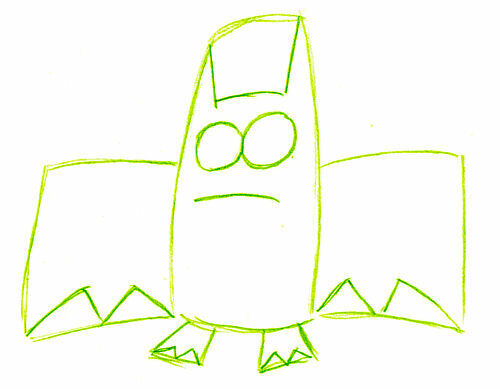 Grab an eraser and remove all useless lines (the ones above the head, below the wings and below the feet). To give more volume to my character and make this one easier to read, I also added a little bit of darker areas on the body, the wings and the feet. Great! 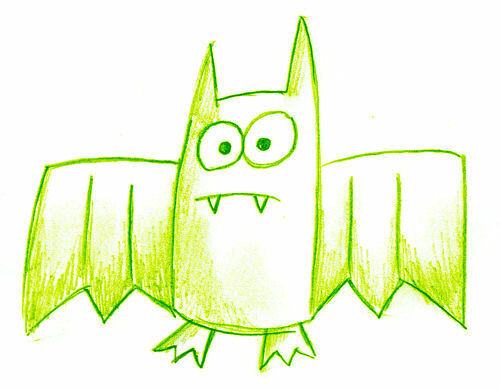 Our bat drawings are getting better! It's now time to open your vector application. Import your final illustration and create dark outlines on it like shown in the image above. In my case, the opacity of the original illustration was set to 50% so that future steps can be easier to read (but you don't need to do that if you don't want to). Move on to the next step by adding more lines to create the eyes, the pupils, the mouth and the teeth. As you can see, the eye on the right of the illustration is slightly larger than the one on the left. Great! You don't need the original drawing anymore. Once this one is deleted, create new shapes that will be placed below the black outlines. Make sure that all shapes are aligned properly. As you can see, you can use a simple plain color on your new shapes for now. 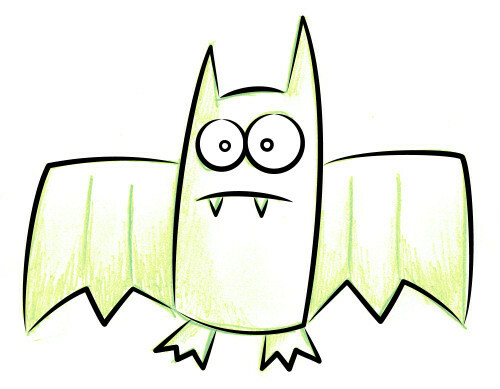 Bat drawings are fun to work with! In this step, select the pupils and add a red color. For the teeth, you will need to create white shapes that will be placed below the lines, but above the grey area. Finally, you can also add a few lines on the wings. These lines are colored in grey. 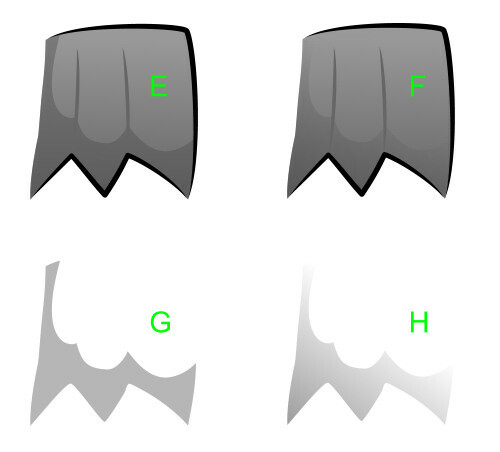 Each vector application comes with a tool named the "gradient fill tool" (or something similar). It allows you to create simple shadows very easily. Select all five shapes individually and use the gradient fill to create simple shadows. Make sure that the bottom part of all shapes is darker. Once you are finished, you can create five new dark shapes to create additional shadows. These new shapes are represented by the dark areas on the illustration above. To speed up the process, here is a small tip that you can use when creating new shapes over existing ones. 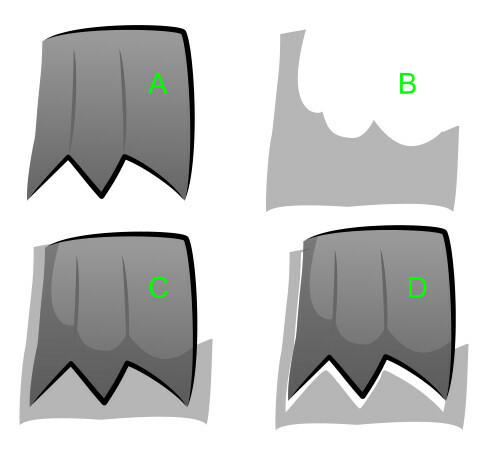 A= this is your original wing. B= This is the new shape that will be used to create the new shadow. 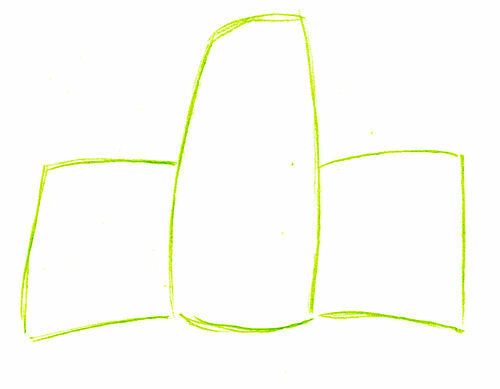 C= As you can see, the new shape is currently larger than the original one. D= To avoid the task of matching these new shapes by hand, you can duplicate the original wing, select this new shape + the shadow and use a slicing tool that will do the work for you! Since all vector software are different, just read the help section to make sure you have selected the appropriate tool! Great! 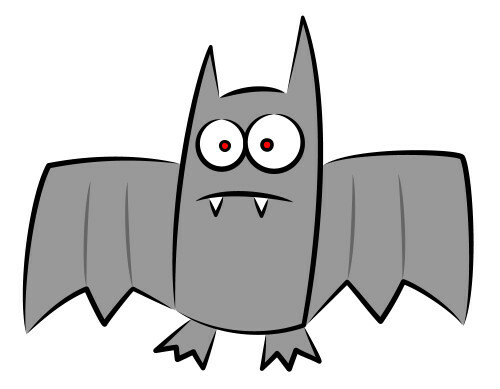 To make these new shadows even more realistic on your bat drawings, I also used a little bit of transparency to hide the top part of the shadow. Of course, the color of the shadow is also lighter than the color used in the previous step. 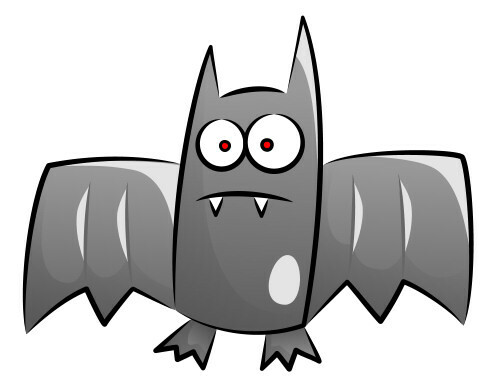 Here is a small sample of how transparency is used to create this effect on the bat drawings. E= This is the wing and the shadow without transparency. F= This is the wing and the shadow with transparency. G= This is the shadow only without transparency. H= This is the shadow only with transparency. Adding dark shadows is a good idea, but you can also create lighter areas that can act like some kind of reflection. Create new shapes on the right ear, the wings and the stomach. You can use the tips above to slice these new shapes. Of course, you can also use the transparency tool to make your new shadows more subtle and effective. Great! As you can see, creating bat drawings is not a simple task, but it can easily be done if you know how to handle a simple sketching process and a few tools on your vector application.